From a recent press release for Ted Nugent’s current tour, the Motor City Madman lists his current favorite guitar heroes. Joe Bonamassa tops that list. 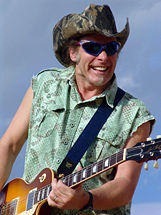 If you remember, Joe and Ted Nugent jammed back a few years ago for Ted Nugent’s show on VH1. It was a private jam at a club in Las Vegas. Since then , Ted and Joe have remained friends. Read the full interview and press release here.